Part of me is a little sad that we are now into the fig and plum season and the strawberries and cherries are over but part of me is also nostalgic for the crisp days of Autumn. It also helps that I love fresh figs. I was able to buy 4 beautiful specimens in my corner supermarket for 59 cents each. I love them raw but roasting them briefly in the oven makes them even more succulent. Cut the figs in half and drizzle with the syrup. Place the figs and walnuts in a baking tin and roast at 170 Celsius for about 8 minutes until you can start to smell the toasted walnuts. Remove from the oven and crush the walnuts with the back of a spoon. 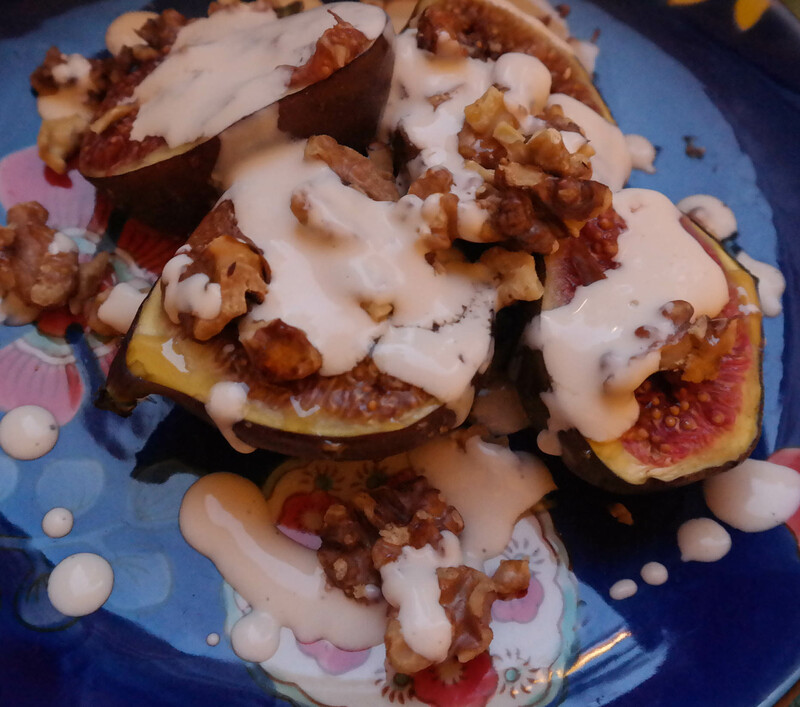 Serve the figs with the walnuts sprinkled over and soya cream poured on top. I do not have much of a sweet tooth and cold, fruit based desserts that are not too sweet are my favourite. 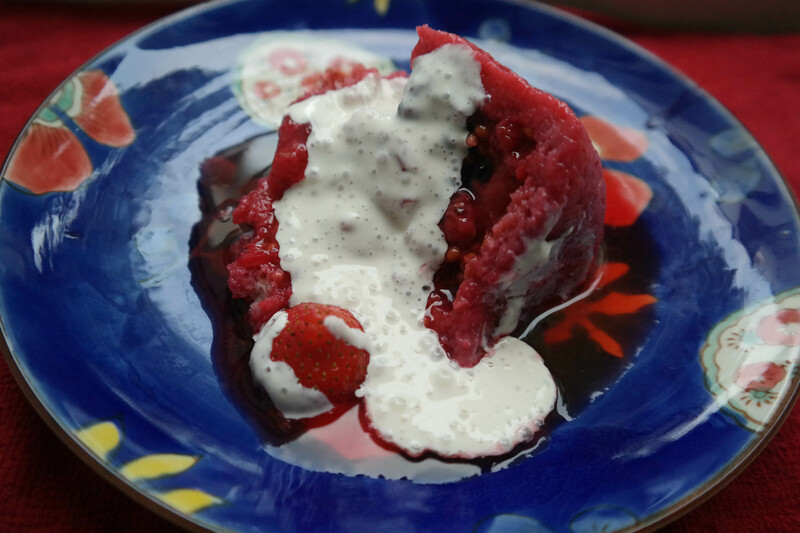 So summer pudding is ideal and for me it always feels special. It is also vegan as long as the bread has no milk added. It is incredibly light and tart and looks amazing. The Germans love their berries. There are many kinds here that I have not seen before. Yesterday I was able to buy 4 different kinds in the tiny supermarket on the corner. The pudding looks really impressive but is actually incredibly easy to make and is hard to get wrong. I used to make these in teacups for individual portions but today I made a big one in a plastic pudding basin that I use for the Christmas pudding. 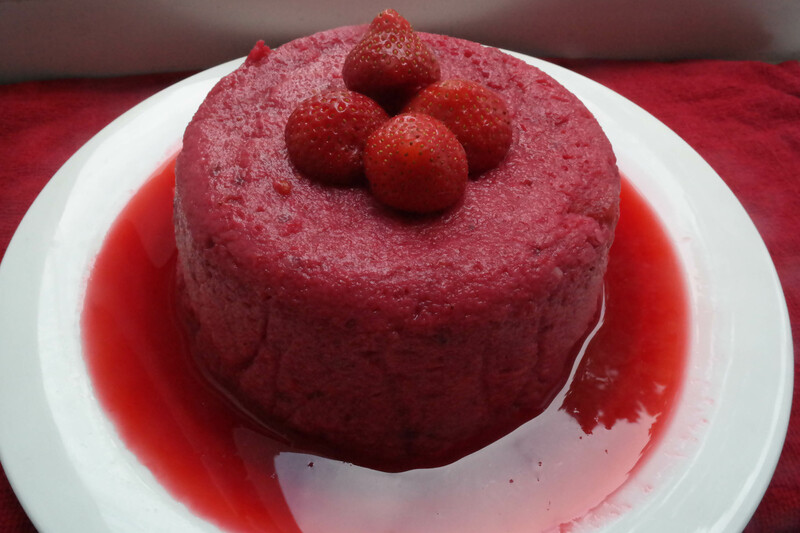 On balance, I prefer the summer pudding because you can manage a second helping. I served this with vegan cream. Place the berries and sugar in a pan and put on the hob on a low heat. Wait for the juice to start coming out of the fruit and then switch off the heat and put on the lid. Leave for 5-10 minutes. You want the fruit to remain whole put to have plenty of juice. Leave to cool. Separate the fruit from the juice using a sieve. Cut the crusts off the bread and use a rolling pin to make the slices thinner. Take a pudding basin and line with clingfilm, leaving enough over the sides to cover the top later. Cut the first slice of bread to line the bottom of the basin and others to line the sides. Dip each slice of bread into the juice until it is covered and line the basin bottom and sides. Fill the centre of the pudding with the fruit. Cut the remaining bread to fit the top of the pudding and soak in juice before using it to seal the top of the pudding. Don’t worry if the bread tears when wet as you can mould it easily and fill any gaps with extra bread. The pudding will turn out well as long as there are no gaps even if it is a bit patched up. You do not have to be precious about it. Pour over a little extra juice. Bring up the sides of the film and cover the top of the pudding. Cover with a plate and place a weight on top. I used a tin filled with water weighing about a kilo. Refrigerator for at least 6 hours. To turn out, place a plate at the bottom of the basin and turn it over. Remove the basin and peel back the film. Pour over extra juice, paying attention to any pale patches on the outside.